Lionel Messi made the most of missing Argentina's 2018 World Cup qualifying fixtures by taking his family out to the cinema instead. The Barcelona superstar retired from international football this summer following Argentina's third consecutive final loss before backtracking in August and announcing his decision to return to the international fold. 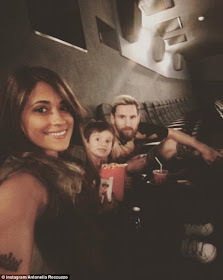 The 29 year-old took the opportunity to relax with his family as he concentrates on making a return for both club and country - with his long-term partner Antonella Roccuzzo sharing an Instagram picture of them, including young son Thiago, from what appears to be an empty cinema.